Is the grass greener on the other side? Frequently people with flat feet yearn for high arches, while those with a high foot arch long for a lower arch. Whether you have a noticeably high or flat arch, being aware of the condition will help in understanding certain arch-related pains and even something as simple as choosing the right pair of running shoes. Let’s explore the definition, causes, effects and exercises to improve the condition. 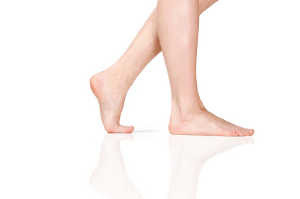 Definition: Flatfoot is a physiological deformation wherein the foot has no arch; when standing, the bottom of the foot touches the floor entirely. Causes: All children are born with flat feet, most naturally develop a normal arch as they grow up. For those that do develop an arch, age, obesity and injury are the most common causes resulting in a fallen arch. The posterior tibial tendon, which supports the arch, can weaken as one ages or puts on excessive weight. Definition: The opposite of flatfeet, where the entire sole of the foot touches the ground, high arched feet have a generous amount of space between the arch and the floor when standing. Causes: Typically pes cavus is caused by a bone or nerve condition creating the unnaturally high arch. Effects: Less frequent than flat foot but more severe in pain, many with high arches find they need corrective treatment or at the least, special and supportive footwear. Many people with high arches place the majority of their weight on the back of the feet, which can cause pain when putting pressure on the feet (walking, exercising, standing). One of the most common effects of this condition is the struggle to find shoes that fit over the arch. Orthotic insoles, footbeds or corrective, supportive shoes may help alleviate mild pain from pes cavus; additionally, surgery is an option to flatten the arch for those with extremely painful situations. Naturally the bones of the foot will have a slight arch; however, if at any point your arches – whether low or high – become irritating or painful, seek medical help. About the Author:MMAR Medical Group Inc. is a wholesale distributor of medical support braces, diabetic shoes for men and women and hot or cold therapy systems. MMAR offers one of the largest selections of support braces for pain and postoperative recovery.